The chapter is an introduction to the challenging period we live in, characterised by the constant reminder of the unpredictability of catastrophic climate events, terroristic attacks, economic crisis, or mass failures of infrastructure systems. At the same time, we are witnessing our planet “shrinking” because of events that generate consequences that have global impacts (e.g. Chernobyl, global warming, 9/11 terrorist attacks, the financial crisis of 2008, etc.). The nature of contemporary risks is unprecedented in terms of their spatial, temporal and potential impact and the traditional categories to control and measure risks are no longer valid. In this context, there has been an evolution of the terms risk and disaster that has enhanced the interest of several academic disciplines; in particular, a new debate has challenged the social science tradition. To face hazards that escape the logic of control, the challenge is to find new ways of relating risks to decisions and practices. 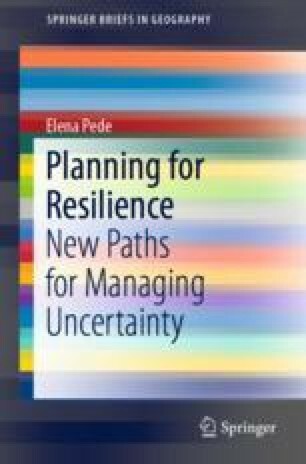 The different paragraphs explore how disasters have changed over the years, the evolution of the concept of control embodied in planning for risk in dealing with today’s challenges and the key issues of the concepts of vulnerability and risk. The last paragraph concludes the chapter by showing the implications of the world risk society introduced by Ulrich Beck.